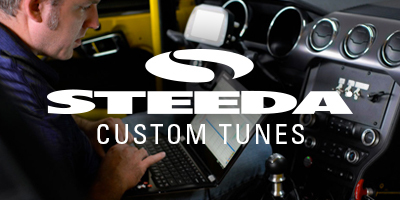 Steeda's Pulley and Tuner Package for the 2010-2011 GT500 is a simple and effective way to add 60 horsepower and over 70ft/lbs of torque to the wheels. This simple package includes our upper supercharger pulley and a custom tuned SCT Xcalibrator 4 handheld tuning device. Simply install the pulley and re-program the PCM with the supplied tuner and enjoy your newfound power. For the do it yourself installer we highly recommend you the use of our pulley removal/install tool part number 555-8902. Note: Damage to supercharger pulley caused by use of the improper tool is not warrantied. 60+ horsepower and 70+ ft/lbs of torque! One of the most cost-effective ways to add instant hp to your ride. Install was a breeze and can be done at home, too.